Each bag is flavour colour coded. There is some positive health marketing at the top: No artificial, MSG, cooked with sunflower oil etc., but this is all contradicted by the governmental regulated health properties on the bottom strip. 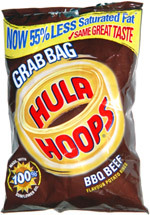 The only other graphic is a dull looking yellow hoop design with ‘Hula Hoops’ written inside. There is no mention of the KP Snacks heritage or branding on the front of the bag. The overall effect really is as dull as marketing design can get. There was not an audible crunch, but rather a dull breaking sort of feel to this snack food. As they were effectively mushed up ingredients solidified, they could not crack and splinter like a Potato Crisp could. The shape of these reconstituted snacks were solid and around 1cm thick, cut in the shape of hoops. The light yellow background colour was coated in a light dusting of brown powder. There was a meaty sort of aroma when the bag was opened. It was not necessarily identifiable as Beef. The flavour was meaty – in the same fashion as the flavour found in Crisps. It is not however Beef. It is more a Beef stock sort of flavour. There was also the addition of the Americanism “BBQ” which is food manufacturing short-hand for the perfectly able word: Barbecue. There was absolutely nothing Barbecue-like about this Beef stock flavouring.